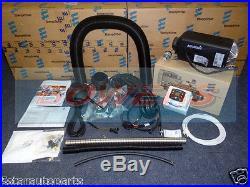 EBERSPACHER D2 AIRTRONIC 801 12V DIESEL NIGHT AIR HEATER NEW 2017 MODEL FULL KIT. 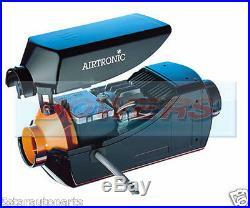 D2 Airtronic 801 Air Heater 12v Diesel. 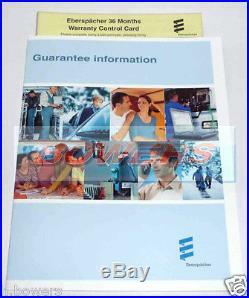 Only officially authorised Eberspacher UK dealers like us (H Bowers) are allowed to sell their heaters. For a list of registered dealers see the following link if they are not on this list then they are not an official dealer irrespective of some stating UK supplier. Be aware of imported kits that are being offered for sale in the UK through non official UK suppliers. Do they stock a wide range of parts & accessories available for quick dispatch? A compact and economical heater. The D2 offers optimised fuel efficiency, a range of operation modes and unsurpassed safety standards. Programmable independent heating (does not use heat from the engine). 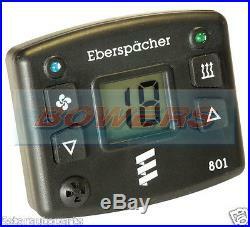 Digital 7 day timers also available in our shop. > Fuel pump with bracket. > Complete heater wiring loom & Connectors. 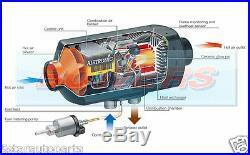 > Air outlet 360° ball type 60mm. All items come with a VAT invoice. We will always go out of our way to source the product you are looking for. Founded in 1939, Bowers has become an important force in the automotive industry with a range of services that are quite unique. Our marketing philosophy is clear and customer orientated with an emphasis on professionalism and instant response. When it comes to service we think we have all the answers offering two channels of operation; auto-electrical and motor factors, each marketing an exclusive programme of brand names and embracing a strategy of dedicated service to our customers. At Bowers we specialise in auto electrical components for motor vehicle body builders, coach fleets, heavy truck operators, mobile plant users, airport ground fleet support companies and the lighter vehicle industry, with our level of service and support being viewed as the standard of achievement for the industry. Here at Bowers we are more than just a supplier, we offer a high quality workshop service & repair facility. Being involved with the demanding automotive aftercare market for many many years has enabled us to gain vital experience which allows us to stand out from our competitors. Our honest, friendly and fully trained workshop technicians have successfully completed a multitude of jobs ranging from heater installation to air conditioning diagnostics and rare heavy duty unit repairs. Based in Stoke-on-Trent, Staffordshire, our team has all the equipment to perform any task and will even carry out site visits if required. Any return costs are the responsibility of the customer. 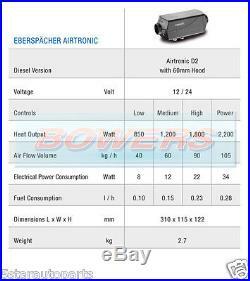 The item "EBERSPACHER D2 AIRTRONIC 801 12V DIESEL NIGHT AIR HEATER NEW 2017 MODEL FULL KIT" is in sale since Tuesday, August 06, 2013. 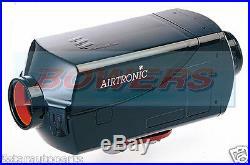 This item is in the category "Vehicle Parts & Accessories\Commercial Vehicles Parts\Other Commercial Vehicles\Other Commercial Vehicle Parts".